This is not a true review. Actually, this bar falls out of the bean-to-bar chocolates I talk about on this site. 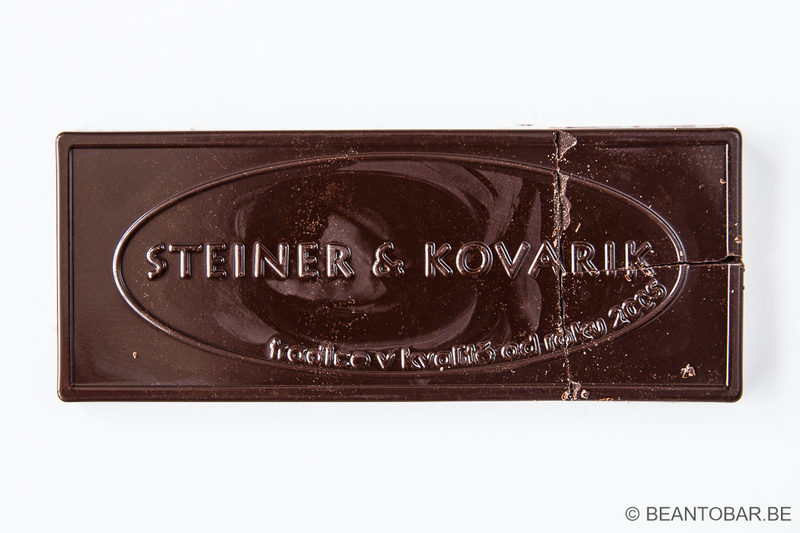 Mainly because I noticed on the website of Steiner & Kovarik they use Barry Callebaut chocolate to produce their bars, making them a fondeur instead of a chocolate maker. This bar was a gift from my colleague who knows my interest in chocolate. 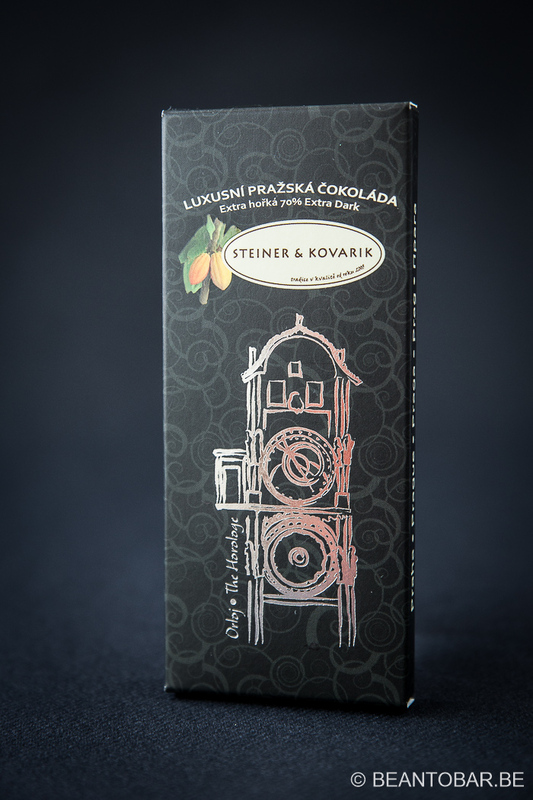 And when you get the chance to taste a Czech made chocolate bar you normally would never get your hands on, one really can’t resist to try it, if not only to give every bar a fair chance and to keep things in perspective! Bean nor origin are noted on the package, meaning this is a blend of cocoa beans of different regions. The ingredients look pretty good at first. 70% percentage is my favorite one. 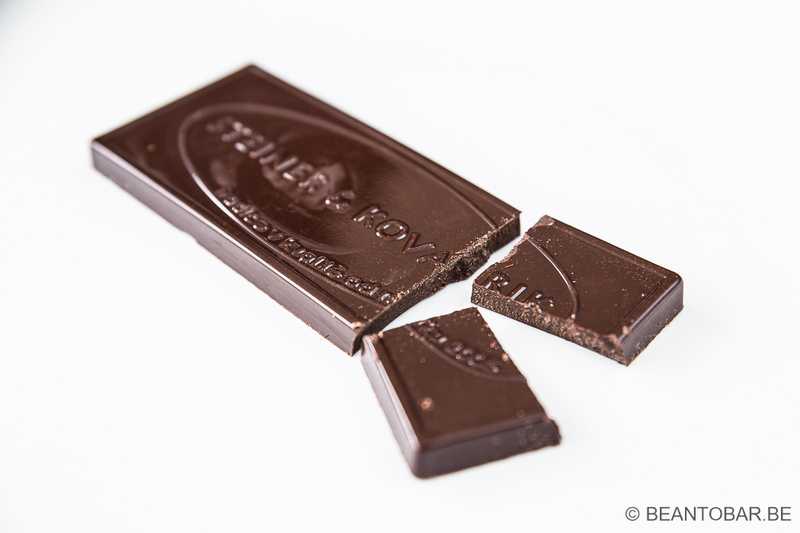 The bar includes cocoa mass, sugar, cocoa butter, soy lecithin and then, oh dear… a number. E476 or Polyglycerol polyricinoleate. This is a real problem for me, right away. Real chocolate doesn’t contain this sort of additives. Some investigation reveals it is another emulsifier used in bakery products. The tablet itself looks good. It has a large imprint of the company’s logo, but otherwise it is just a rectangular piece of chocolate. I like that sort of minimalism. The front is shining like newly polished shoes. But the back doesn’t. A strange sight. The aroma is sweet, slightly roasted and perhaps a bit earthy. The snap is pretty soft. For a 70% bar, it is mighty sweet. A flash of roasted aroma’s, some coffee perhaps and some strange cigarette tobacco notes I recognize from other Callebaut based products. The melt is quick and the texture is smooth, without being to clingy. Highly inoffensive as there is absolutely no bitterness or tannins to be found. Other than this, the flavor is monotone and doesn’t evolve. The aftertaste remains chocolaty for a while and turns to bitter/sour in the long run. It surely isn’t the worst piece of chocolate I’ve tried. It doesn’t offer the strange off flavors other industrial chocolate may bring, but it doesn’t sing either. It is in fact pretty generic. Bars like this one won’t really win over people to try the fine chocolate bars around, as they lack the splendid flavors to be found in good origin bars. But one can’t know without trying, so now we know!